Linear Park, on the banks of Sturt River in Adelaide has many opportunities for wedding photography. There are large gums and other Australian natives, bulrushes, bridges, paths and walking trails. There is even a cave! It is really easy to find a spot for your wedding photography along this bank - as a photographer, I check out places the day before your special day so that I can find a top spot that really suits the vibe of your wedding. That way things are pretty relaxed and organised on the day and there is no time wasted trying to get the top spots for photos! Handsome Seth with his beautiful oriental princess bride were married on the side of one of Sfera's newly decorated ceremony rooms. Seth and Jasmine first met at school - in fact, they spent a lot of their school life together but they only realised they were made for each other after they had left school and got on with their own lives! I love the way they are looking at each other in this photo with the afternoon golden glow through the bulrushes and gums. The whole photo has an ethereal look about it which can often make it extra romantic. I often like to take photos with the sun behind couples so we get the best use of the natural light. 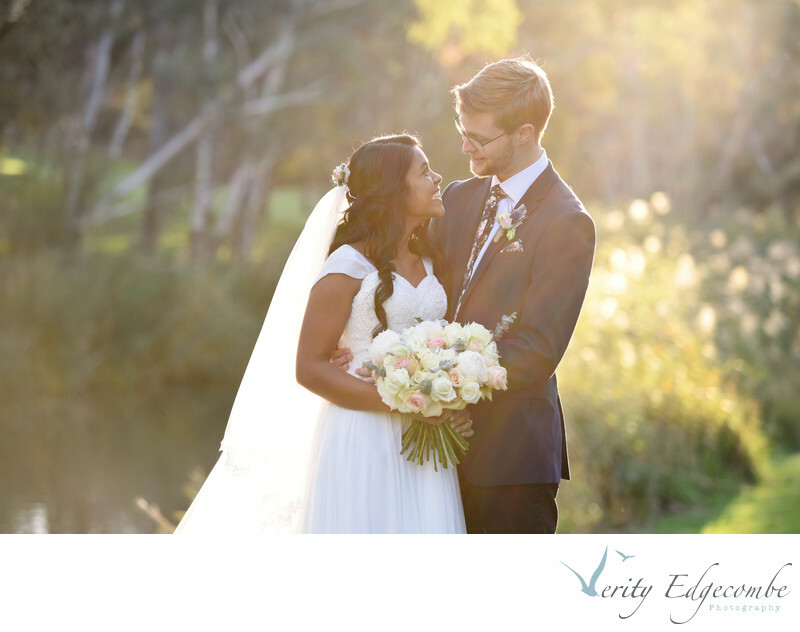 After the relaxed and easy going photo session Seth and Jasmine went back to S'fera's for their reception in the elegant ballroom complete with chandeliers and large floral table centres. Location: Linear Park, Highbury, South Australia.